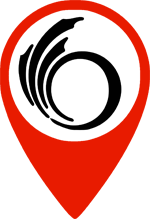 Ottawa Hot Air is based in Ottawa, Ontario, Canada. 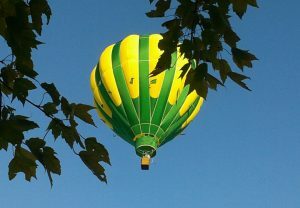 We offer VIP Balloon Rides, Corporate Balloon Advertising, Balloon Flight Training and Special Shape Hot Air Balloons. 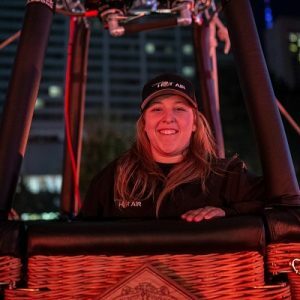 The people behind Ottawa Hot Air are veterans of the sport of ballooning and together have over 3000 hours and over 75 years of combined hot air balloon piloting experience - all over the world, as well as in the USA and right here in Canada. 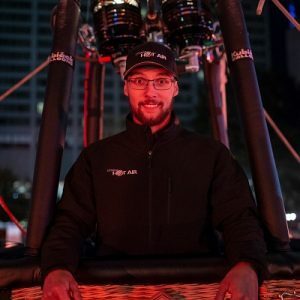 While the competition puts you in a large, overcrowded basket with 12-16+ strangers, we offer you a personal and private hot air balloon experience. Hot air ballooning is such a beautiful and spectacular experience, that it is best shared in a private flight - with the closest people in your life. WHY CHOOSE OTTAWA HOT AIR? 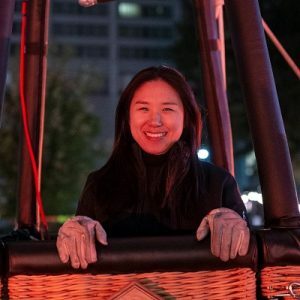 Mostly, because we only offer exclusive, private hot air balloon rides. 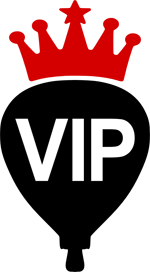 While the competition wants you to pay now - and reserve later - sometimes weeks or months in the future - our schedule is right here on our booking page, so you can see when we are available before you buy. Also, we are real. Real people, that own their own balloons, right here in Ottawa, Ontario, Canada. We are not a fly-by-night booking agent, or a discount-rate hoax (hint: read their fine print). 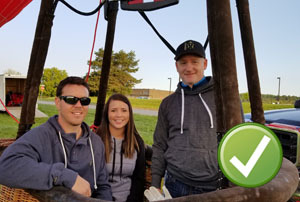 Our hot air balloons only take 2, 3 or 4 passengers at a time, which makes your hot air balloon ride adventure more fun and more personal than you could have ever expected. Safety is our number 1 priority. We have extensive experience flying hot air balloons in the Ottawa and eastern Ontario region (as well as many other places in the world), and our passion for hot air ballooning makes us the perfect choice to take your balloon adventure to great heights. We live and work right here in Ottawa. We own and operate our own balloons, and we are committed to this great city. We fly three out of the four seasons. Summer and Autumn on select weekday evenings and weekends and sometimes even in Winter. Snow melt and wet fields prevent us from flying in the early winter and early spring. We guarantee you will fly. 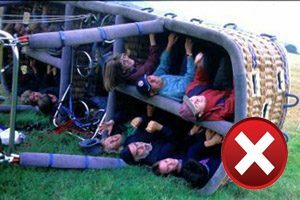 If the weather isn't safe for a balloon flight on the day you chose to fly with us, you will will be able to reschedule for another available day that is convenient for you. Alain has been an avid flying enthusiast his entire life. As a young boy, he built and flew dozens of his model aircraft creations. As a certified skydiver, Alain has jumped almost 1,000 times from various types of aircraft, helicopters and hot air balloons, and is a certified skydiving instructor and parachute rigger. In 2012, he achieved the Canadian record for the largest formation in freefall (102 parachutists). 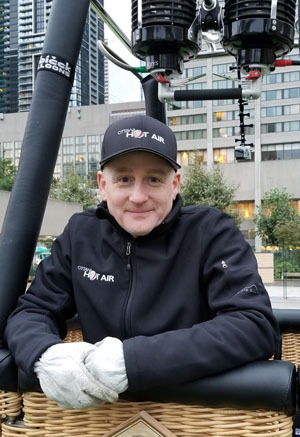 Alain is a paraglider pilot, and is a Transport Canada certified pilot in powered paragliders and hot air balloons and a hot air balloon flight instructor. 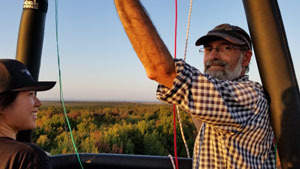 Since 2009, Alain's main passion has been piloting Hot Air Balloons. He is one of the rare people in the world to have constructed his own hot air balloons and baskets from scratch. 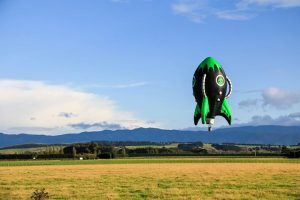 One of them being a "Special Shape" hot air balloon in the shape of an Alien Rocket Ship. 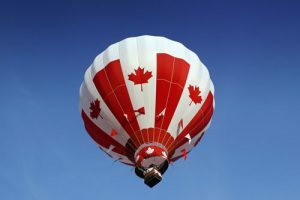 Alain has flown balloons in some far-away places in the world, including Malaysia, Thailand, Taiwan, Philippines and New Zealand, as well as locally at many of the hot air balloon festival in Canada and the USA. 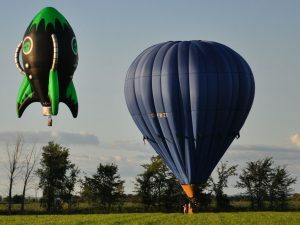 Alain is the Ontario sales representative for Kubicek Balloons, one of the largest balloon manufacturers in the world. 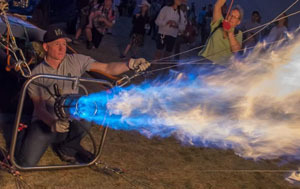 Since 2012, Alain has been the President of the National Capital Balloon Club where, along with other club members, he has helped create several other balloons from scratch. As President, he helps promote the sport in the National Capital region and also acts as liaison to Transport Canada. Jean has been involved in ballooning for over 25 years when his wife initially registered them both as volunteer crew for the Gatineau Hot Air Balloon Festival. Being bilingual he was asked to help the festival's balloon committee so during those early years he has been: Crew Director , Launch Director, Flight Security Officer and Assistant Balloonmeister. Over the last 14 years Jean has flown all over Canada and the USA, but his favorite place to fly is in Eastern Ontario. 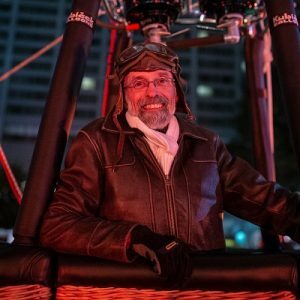 His biggest accomplishment and best balloon experiences is helping other pilots build special shape balloons and flying the first flights. Size: AX-7, 77,000 cu ft. Size: AX-8, 105,000 cu ft. 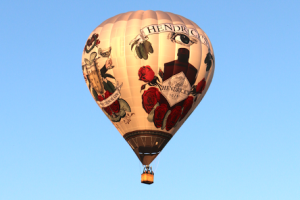 Size: AX-8, 106,000 cu ft.
We also have a fleet of Special Shape Hot Air Balloons.